We left Victoria and its freezing weather (it is said that one can experience all four seasons in the same day in Victoria) to drive back to Adelaide, in the state of South Australia. On the road we pass many towns with the most fascinating names. There is Nar Nar Goon (Jar Jar Binks' hometown? ), Mount Ararat, Garfield and Robin Hood. Melbourne even has Batman Avenue, after a pioneer of that name. After a few hundred kilometers (who's counting?) 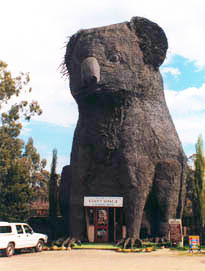 we stopped at the rest area of the Giant Koala. This sculpture contains a souvenir shop and a restaurant. It seems that Australian highways are strewn with such artsy highway stops. The differences between Victoria and South Australia are present all the way into details such as accident markers. In Victoria, the locations of accidents are marked with stones that are covered in flowers. In South Australia, a white "I" on a red pole means injuries, a red cross on a black pole means the accident was deadly. Victoria is the Garden State, and SA is, appropriately, the Festival State. 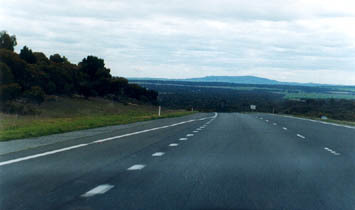 As we approached Adelaide, the land lost some of its flatness. I felt much happier at Anne's place, where the weather is friendlier. 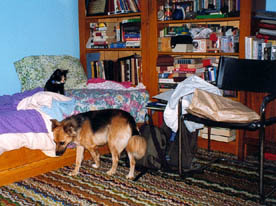 Besides, I was welcomed there by a bunch of pets. 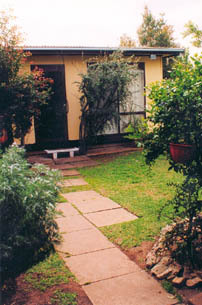 The room I was assigned was in the garden and belonged to the cats, Megsy and Karma, who kept me warm at night during my stay. My roommates. Karma learned to fly during my stay (don't ask). Sour sob! I couldn't believe it! Anne's garden was full of sour sob! This flower we call hummeyda grows abundantly in Lebanon in the spring, and I would never have expected to find it in Australia, of all places. 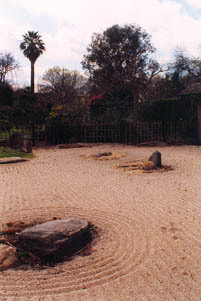 Anne took me around Adelaide, in particular to the Adelaide-Himeji garden, a foretaste of a trip to come. The garden was opened to commemorate the two cities becoming Sister Cities in 1982. While I was savoring the irony of having a palm tree in the background of a Japanese garden, I was shocked to hear a familiar sound. I turned to find a whole flight of rainbow lorikeets, replicas of my pet lorikeet Figaro, chattering in a tree.